Oshkosh Public Library establishes Funds for Library Excellence at Oshkosh Area Community Foundation. Learn more about this exciting new way to support the library and maximize the power of your gift. Your donation could help the library add to our selection of books, movies and music. Your gift could be used to enhance the library building or expand an important service. A donation is a wonderful memorial for someone who valued the library and their time spent here. Donate to the Trust Funds for Library Excellence at the Oshkosh Area Community Foundation. For information call 920-426-3993. Send a check to the Oshkosh Public Library at 106 Washington Ave., Oshkosh, WI 54901. 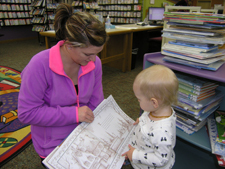 Include the Oshkosh Public Library in your estate planning. Ask your financial advisor about the benefits of including a cash gift, or assets from retirement plans, life insurance or other sources in your will. To discuss making a substantial gift to the library, contact Jeff Gilderson-Duwe, Library Director, at 920-236-5210. Donate your used books for the Friends of the Library used book sale during library open hours. For large donations, contact Vicki Vandenberg at 920-236-5210. Purchase best-seller books and other materials. Bring authors into Oshkosh’s elementary schools for programs that educate and inspire students to try writing and illustrating. Set up the OurSpace teen area, build teen reading collections and offer author, technology and art programs for teens. Collect and publish digital collections of photos and community information that preserve Oshkosh history. Establish outstanding genealogy resources and research assistance. Your donation could help the library to support children's literacy, build popular collections such as eBooks, preserve local history resources and update technology available to library users. Our wish list has specific suggestions that your donation could help to fund for the library.